Last week, I was at Enterprise 2.0 in Boston which is a major conference and trade show for the 2.0 crowd. The conference was a bit different than last year – with a new, bigger venue and a much stronger presence from the ECM vendors. On the buzzwords front, “Facebook for the enterprise” is out while “social business” and “social analytics” are in. It was fun to catch up on all the 2.0 buzz! One of the new trends I’ve seen was the growing use of QR codes. QR codes are 2-dimensional bar-codes that contain small amounts of valuable information such as URLs, contact data, geographic coordinates, Wi-Fi network information, SMS, or a text message. Compared to regular bar codes, QR codes can contain much more data. That comes in handy with mobile devices since most of us don’t like to type on them due to the small keyboard size. QR codes provide a great shortcut as they allow us to capture data via the built-in camera. The QR code reader app analyzes quickly the captured image, extracts the data – and in most cases acts on it immediately. For example, when the QR code contains an URL, the reader takes us directly to that URL in the browser. QR codes are obviously hugely effective anywhere the traditional bar codes worked well. You need to order a spare part? Just scan the QR on the broken part and the app brings you straight to the right catalog entry. Do you need to keep track of patient records in a hospital? Use the QR code on her wristband to check all the drugs, procedures and materials she used. Do you need to locate the right crate in a warehouse? Just scan the QR code in the physical records application and off you go. Unlike bar-codes, however, QR codes are much more mobile and don’t require any proprietary reader device – you can download one of many free apps onto the smartphone that you already own. That enables many new use cases. For example, airlines started using QR codes as a paperless boarding pass. Real estate companies started sticking them onto the “for sale” signs in front of a house to give you an on the spot tour of the property, eliminating those rain-soaked fliers. For marketers, QR codes can serve as a virtual coupon, offering you an interesting on-site promotion and taking you straight to the purchase page with a single snap. At the tradeshow, I was surprised by two things. The first is that even though the QR codes are becoming pretty omnipresent in advertising, most people didn’t know what they were and didn’t have a QR code reader installed on their smartphone. This is the geek crowd, the intellectual elite of the enterprise 2.0 world, the folks who are always connected and on top of the latest market trends. That makes me wonder how effective those QR codes on billboards are. Most likely, the number of clicks is rather dismal. The other thing that surprised me was that many of the QR codes splattered on the banners were just taking me to a marketing web page. I’m standing in front of a booth where I could see a live demo and talk to real people and, instead, they expected me to just check out their web site? I didn’t need to come to the trade show to do that. To their credit, though, several of the QR codes I tried took me to a page offering some sort of value – a free analyst report (great) or a white paper (not that great). Clearly, the marketing use of QR codes is still in their infancy. Over time, we will likely get a much higher population of users with QR code readers installed and using them readily. And we will develop marketing tactics that will make it worthwhile snapping pictures of QR codes. Or perhaps we will use some completely different technology. How about implanted RFID chips or the omnipresent retina scanners like in the movie Minority Report? We’ll see. For now, I encourage you to get a QR code reader – I use i-nigma although most readers I tested were just as good. Try it out! Over here in Germany I see QR-Codes more and more - still not a lot compelling applications. But I'm really curios about this battle between NFC and QR-Codes for establishing touch points between business and customers. I have been to a social business tweetup in Frankfurt yesterday. All badges had the real name printed & QR-Code for twitter. Discussions were around monetizing campaigns for local businesses. It got into an argument between GPS based versus QR-Code based models. And btw. 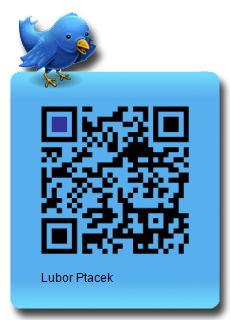 customers are excited about my business cards with a vcard in a QR-Code. One scan, confirm address book entry, done. Thanks for commenting, Joerg. Yes, NFC (near field communication) is another technology that fits into this discussion. We'll see what the adoption looks like down the road. And great point on the business cards - that's one of the most useful use cases for QR codes!